Rubber Kitchen Flooring Style and Durability? 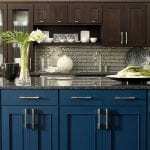 Rubber kitchen flooring is becoming recognized as a great option for the ability to take heavy foot traffic. Add to this durability, ease of cleaning and great non-skid surfaces. Not surprisingly, rubber floors are the preferred choice in restaurant kitchens, showrooms, day-care centres and even patios and decks. With the variety of colours, shapes and styles available, rubber is a long-lasting option for floors and can match most decors if we compare this to other types of kitchen floors. Suited to the kind of activity we usually have in a kitchen, the biggest advantage is rubber’s resistance to spills that are greasy, because it is so easy to clean. 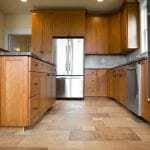 Rubber is also comfortable on the knees and feet and is less stressful to stand on than other hard kitchen flooring material. You are less likely to skid or slip. 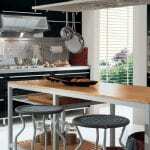 There are rubber kitchen floorings available today that are grease resistant. These sheets can be welded using heat after they are installed with a solvent free sealant. 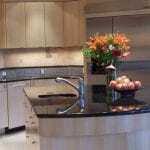 You can buy rubber kitchen flooring in tile or sheet form and as interlocking tiles. These are available in different shapes, sizes and colours that can be mixed and matched to make your own customized design. Most people find rubber perfect for areas around the kitchen sink, the stove the area where food is prepared since these are areas where one especially wants to be careful about falls, spills and skids. Rubber flooring retains its colour throughout its life, looking bright since the colour is consistent through the material. Rubber’s most outstanding features are its flexibility, strength, ability to insulate and above all, its affordability. 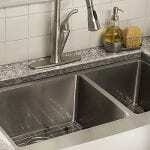 It can last several years, is easy to clean and can take a lot of rough use. You could stand on it for hours and still feel comfortable. Rubber flooring is a little more difficult compared to other kitchen flooring material to source. Some people feel that there is not much choice available. However, all that is changing with different variations being introduced in the market.